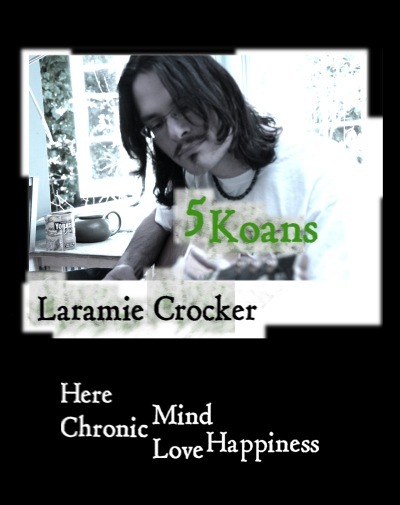 5 Koans is a piece in 5 parts, each part is a koan, a song, a story. The Monkey Mind can hear each koan, and percieve it and its ideal, and feel disappointment after each song, that the monkey truth came true anyway, and reality sux and here we are again. And the buddha-self can hear the koans and recognize them for the traps that they are, and that by paying attention to the instructions, each koan may be occupied in the here and now, and each space may be enjoyed fully. In Love, be in love, or monkey-mind think about love. In Mind, be in the mind in the garden in the mind, or, think about the mind and the walled garden mind and feel superior and judge. In Here, think about time, or vibrato, or arpeggio, or just be right here, right now, HERE. If you are really here, then you will enjoy what's happening. In Chronic, feel the clocks, the recurrence, the addiction, the inexorability. I wrote these songs about the time I was reading Aldous Huxley's "Island." Placing the first song as koan #1 is like the Minah birds calling "Attention," and "Here and now, boys!" On the last track, surreptitiously, my local crows in my garden got in the last loop of the album. As Happiness retreats to a fading memory, you can hear the crows saying "Here and Now, boys." Listen to the music. for teaching me about koans, delicious traps, and how to escape them.